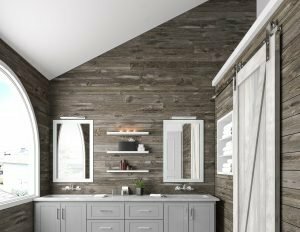 Sliding barn doors are the hottest trend in home design right now. Whether it is a single sliding door used to creatively hide the kitchen pantry or a set of sliding doors that allow for separation between the living and dining room while still allowing for the open concept feel, sliding barn doors are an integral design piece for the home. The good news is, even if you are not building a new home, you can easily incorporate sliding barn doors into your existing home. Sliding barn doors are a simple way to update your home, and, unlike pocket doors, sliding doors can be easily retrofitted into an existing opening. Sliding barn style doors can either mimic the look of your existing interior doors or you can select a completely different style. Here are some questions to consider when selecting your new barn doors. Do I want my barn doors to mimic my current interior doors, or do I want a completely different look? Either way will look great and add style to the room. What design do I want for my door slabs or panels? Are you looking for a traditional, rustic look? Are you wanting to add some character to your doors that really represent your personality, like specialty glass or leather? The design capabilities are as expansive as your imagination will allow. What types of material are available for sliding barn doors? The two primary options of materials for barn doors are MDF, a smooth paint-grade material, or wood. Some wood examples to choose from are Pine, Knotty Alder, Maple, Mahogany, Fir, Oak as well as a slew of specialty wood. Do I want a stained wood or a painted finish? Any of the wood options can be stained or painted to achieve different looks, however the MDF option is only available as a paint-grade option. A stained barn door can add warmth and a rustic feel to a room, whereas a brightly painted door can act as the standout feature. What hardware is available for my sliding doors? The sliding hardware itself comes in finishes such as satin nickel, black, oil-rubbed bronze and more. Once you have selected your hardware track color, then it is time to look at the “jewelry” for the door panels. Depending on the look you are trying to achieve, there are endless hardware options to complement the look of the door panel. If you are looking to add sliding barn doors or barn siding to your home, a showroom consultation is a great way to start your process. Franklin Window & Door carries Simpson interior doors and Rustix Weathered Barn Siding. They also have hardware options to help you decide which hardware you want for your barn doors. To schedule your design consultation, call Franklin Window & Door today at 317-993-3660.